Marcel Martinet was involved in avant-garde literary circles in France in the early part of the twentieth century and was later closely associated with the campaign against the first world war, not least through his collection of ferocious anti-war poems, Les Temps maudits. In the 1920s Martinet was literary editor of the Communist daily newspaper L’Humanité, and was influential in shaping the party’s relations with intellectuals and promoting working-class culture. He left the party in 1924 and became a relentless critic of Stalin’s influence on the revolutionary movement. Throughout his life he continued to write poetry, novels and plays. This book is the first dedicated to Martinet‘s life and work and contains many poems translated into English for the first time along with their French originals. George Paizis is a member of the French Department at University College London. In 1919, France’s foremost literary prize, the Prix Goncourt, was won by Proust. One of the runners-up was Marcel Martinet with La Maison à l’Abri (“The House out of Harm’s Reach”). 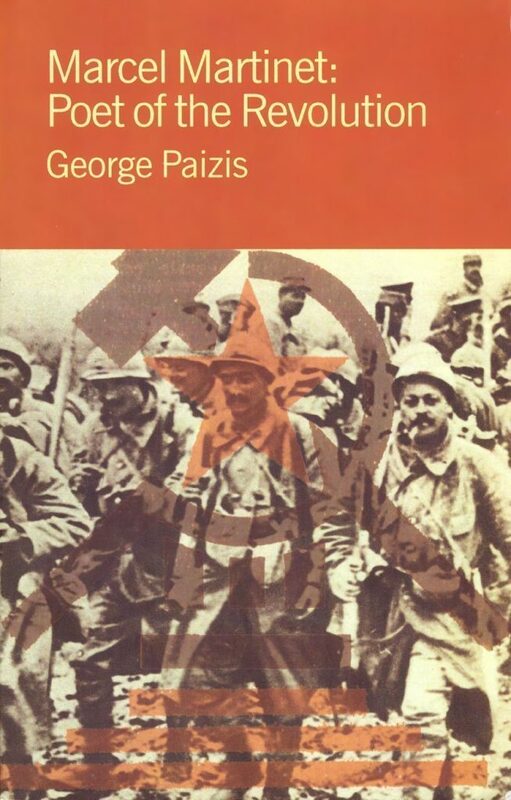 It’s a novel about the first world war seen through the eyes of a group of tenants living in the same house, and George Paizis’ account of the book suggests shifts and conflicts reminiscent of Chekhov or Sean O’Casey. Martinet was someone who not only opposed the war in the build-up to 1914, but, unlike many of a similar outlook, went on opposing it throughout. The book can’t be pigeon-holed as an “anti-war novel” though, because it gives voice to a whole range of attitudes that develop and twist as loved ones are injured or killed. So, Paizis has excavated someone whom very few English-speaking readers will have heard of and he is keen to place Martinet both in his times and in the context of his own political activity – which was considerable. Martinet was born in Dijon in 1887, to parents with migrant origins (Italian and Polish-Jewish). He was heading for a degree in France’s top college when he gave it up with a lifetime commitment to a refus de parvenir, a “refusal to ‘make it'”, a turn-away from careerism. In the first years of the Communist party, he was at its heart, writing pages in its daily paper on what we would now call literary theory. But it wasn’t long before he was on the outside, finding himself in the company of other socialist and Marxist critics of Stalinism – though he seems to have been uncomfortable with being too close to André Breton and the surrealists on this matter. What’s more, he wrote a play, La Nuit, which Paizis argues anticipates Brecht both in its method and its intent. If we need labels, Paizis tucks away in a footnote the suggestion that at heart, Martinet wasn’t anyone’s “party” man, he was probably a “revolutionary syndicalist”. Martinet didn’t see action – he was deemed to be not fit enough – so when he imagines the other side, it’s not as another soldier, as with Owen’s “Strange Meeting”, but as a German poet who in parallel will be “weeping over our dead and yours”. Then, as if expanding Sassoon’s idea of turning the guns on his own leaders, Martinet pleads for some kind of revolutionary revenge. Our attitude to French literature in this country seems seriously skewed towards the 19th-century novel, with such figures as the Musketeers, les Misérables and Emma Bovary leading active lives well away from the page. Twentieth-century French literature is a different matter, where the novels, plays and poems seem caught up in a complicatedly French crossfire – both literal and literary. Anyone unacquainted with the story of the occupation or the position of the French Communist party, settling down to a comfortable read of Le Silence de la Mer by “Vercors” or a night-out to see Sartre’s Les Mains Sales, might well wonder why these works became important in France. And in several ways, I found that this scholarly and fascinating book reads as a preface to the life and work of Sartre. The themes that he worked on in, say, Les Mains Sales and What is Literature? seem to be prefigured by Martinet, so, if nothing else, it’s helpful to be reminded that Sartre didn’t just invent his position out of nowhere.